Msgr. 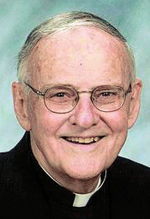 James J. Howard, pastor emeritus of the Cathedral Basilica of SS. Peter and Paul, died Oct. 28. As rector for 27 years from 1973-2004, he was the longest serving pastor in the 150-year history of the cathedral. Born in Pottsville, Pa., the son of the late James J. and the late Veronica (Sponard) Howard, he attended St. Patrick School in Pottsville and Pottsville Catholic High School before entering St. Charles Borromeo Seminary. Bishop Louis A. DeSimone remembers his seminary classmate’s obvious leadership potential. “We would look his way when he said things,” Bishop DeSimone recalls. That trait would remain evident during Msgr. Howard’s years in high school administration and as rector of the cathedral, the bishop remembers. Msgr. Howard was ordained May 10, 1952 at the cathedral by Archbishop John F. O’Hara, and his first assignments were as parochial vicar at St. Mary Parish, Beaver Meadows; St. Francis de Sales, Lenni and Our Lady of Angels, Philadelphia. Immaculate Heart Sister Frances D’Alessandro grew up in Our Lady of Angels, and Father Howard became a close and lifelong friend to her family to the point of being family. Msgr. Howard also taught at Msgr. Bonner High School and he was appointed to the faculty of Cardinal Dougherty High School, successively as teacher, vice principal and principal. Father Paul M. Kennedy was a student at Dougherty in those years. “That was the time Cardinal Dougherty had 6,000 students and he went from being the disciplinarian to being the principal and he made the transition very smoothly. He had the good of the school at heart, and was a great supporter of Cardinal Dougherty after that; he was proud of his years there. He was a great story teller and always had a smile,” Father Kennedy said. His years as rector of the cathedral which followed were eventful, and included a visit by Blessed Teresa of Calcutta in 1974, the 41st International Eucharistic Congress in 1976 and the visit of St. John Paul II in 1979. But the cathedral is also a parish and Lou Ferrero, a lifelong parishioner, remembers Msgr. Howard as “the boss,” who was very hands-on but fiercely independent. Msgr. Howard’s funeral Mass will be celebrated at his beloved cathedral by Archbishop Charles J. Chaput at 11 a.m. on Wednesday, Nov. 5. The Mass will be preceded by a viewing. Concelebrants of the Mass will include Bishop DeSimone, Msgrs. Joseph C. McLoone, Robert T. McManus, James E. Mortimer and William J.J. O’Donnell; Father David B. Machain and Father Kennedy, who will be the homilist. Actively participating at the funeral will be members of the Police, Fire and Peacekeepers League of the Sacred Heart, of which he was spiritual director for 41 years, according to Police Captain Lou Campione, who is the group’s current chaplain. Msgr. Howard is survived by a cousin, Joan, and by Sister Frances. Interment will be at Calvary Cemetery, Pottsville. Fr. Howard was my principal at CD in 1969-1973. I loved him as a father, he called all the girls “Sis”. He is forever a jewel in my heart. Fr. Howard, excuse me, Monsignor Howard would walk with me to class many times even though it was on his way to do something else, it seemed he walked my walk and we chatted and he gave me strength to face the challenges of High School. Always smiling. God bless you Msg. Howard.